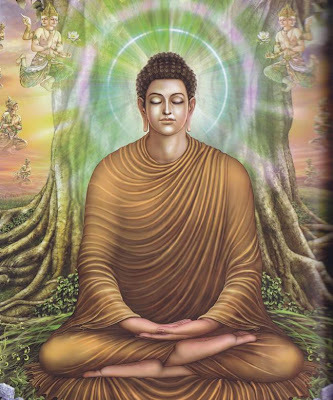 A Sinhalese Artist's depiction of the Buddha under the Bodhi tree soon after enlightenment. The devas in the background worshipping Him. After seeing the gold bowl float upstream, Ascetic Siddhattha crossed the river Anoma,. A little way further up he found a nice tree to sit and meditate underneath. A passing Brahmin had offered him a pile of grass to be used as a seat. He spread the grass underneath the tree and took seat. He then determined thus. “Let my blood, bones and sinews dry up, I shall not get up from this seat, until I have realised the cause behind suffering and freedom from it”. He then resorted to what is unique to Him as His own meditation technique. Hitherto, He had tried all the techniques that had been taught to him by others, but they were of no avail on his quest to end suffering. Now He started on His own method. His mind was full of “ mettha” (loving kindness) and compassion. With a mind full of compassion and kindness He started the “Ana-pana” meditation that was unique to him from his childhood. In the early hours of the full moon day in May, He achieved “Samma Sambodhi-hood” (Perfectly complete enlightenment). Enjoying the peace of Sambodhihood he stayed seated under the tree, which thenceforth came to be known as “Bodhi- tree”. (Bodhi means enlightenment). Thereafter, on the second week He paid gratitude to the tree which gave Him shade throughout His ordeal of breaking all fetters and defeating Mara[i], by blessing the tree with unblinking eyes. On the third week He created a Chankamana, a walking meditation path in gold and spent his time in walking meditation. The fourth week he created a “Gold Roof with four gold pillars and floor”, (Rathana-Ghara) closeby to the Bodhi tree, and stayed within it meditating. On the fifth week He moved away from the Bodhi tree and sat in meditation underneath the Banyan Tree which was called “Ajapala”. There, two merchants passing by offered him bee’s honey and rice cracker-flakes (rice crackers - the Sinhala scriptures say "Wilanda”, which is a form of blown-out flakes of rice like pop corns). The Buddha accepted and ate this. Thus, this was the first meal the Buddha had in more than five weeks. The two merchants were Tha-us and Balaka. (Some people say Thapassu-Bhalluka which were the Indianised names of the two). They were from Hela-Diva the present day Sri Lanka, (Ceylon). They were highly impressed seeing the Buddha in all his glory, and after listening to a Dhamma discourse they became the first of His disciples. They took refuge in Buddha and Dhamma, as the Sangha were not yet founded at this time. On their request for something for veneration, the Buddha gave them a lock of His hair. This, they brought to their home country and enshrined it in a “Da-gaba” in Trincomalee, Sri Lanka where it is preserved up to this day. So, the first to disciples of the Buddha were actually two Ceylonese (Sinhalese) merchants. There had been a route passing this place from Trincomalee to the Northern parts of India, which was taken constantly by Ceylonese sea farers. “Naga” in ancient Sinhalese means a navigator (-“ නැව් ගාමී - නාග”- refer writings by Acharya Arisen Ahubudu[ii].) . On the sixth week he was sitting in meditation by a pond a little way further up the Banyan tree. During this week the rains started to come down while the Buddha was thus seated. Another seafarer who was travelling with Tha-us and Balaka, but delayed on the way due to his business needs came by and seeing the Buddha getting wet, drew up curtains to shield him from the rain. As he was a Naga, this act later-on gave rise to the story of a big cobra (“naga” in Indian languages means a cobra) coiling round to shield the Blessed One from the rain with his hood. This passerby was called Mudhalindu (මුදලිඳු)which in Sinhalese means a chieftain (derivatives of which even exists today used as a common surname). That is how the said cobra’s name happened to be Muchalinda. On the seventh week the Blessed One stayed at Rajayathana, where he reflected that even though very deep, there indeed are people among the populace who would be able to understand and cross the borders to Nibbana and end suffering. He reflected thus, “Like the lotus flowers that bloom out of the muddy waters to shine radiantly on the surface without touching the mud, among the tainted populace there would be those who would come out of defilements to be virtuous and free, then shine the world in true Dhamma”. There is a story that Maha Brahma called Sahampathi invited him to teach at this moment. At first He thought of going to Alara Kaalaama and Uddaka Ramaputtha to help them gain knowledge on how to end suffering. However, seeing that they have already passed away to “Neva Sagna Na-sagna” and “ Akasha sagna" yathana respectively, He decided to teach the “ Pancha waggiya bhikkhus”, the five friends who cared for him during his time of severe ascetic practices. He then saw with His divine eye that the five are now residing at Isipathana, Migadaya, (the deer park at Isipathana (Miga=deer ; daya=sanctuary). Thus, He set forth on foot to Isipathana (present day Uttar Pradesh) from the place where the Bodhi tree was, present day Budhgaya in Bihar, which is a formidable distance. From these historical records we can see that, at first when Siddhattha Gauthama became perfectly enlightened, He was quite a glorious person to look at. So much so that all the passers-by were struck by His personality and gazed at him in wonder. When the Buddha was seated under the Ajapala Banyan tree, a young passerby named Upaka seeing Him simply jumped. He then approached the Buddha and asked if He were God. The Buddha replied “No”. Then he asked the Buddha if He were the Devil to which the Blessed one replied “No”. Then he inquired "Are you Man?" to which the Buddha again replied "No". “Who are you then?” Upaka asked. The Buddha replied, “ I am Samma Sam Buddha.” But Upaka, did not understand. Apart from Upaka, Tha-us and Balaka, and Mudalindu too, were highly impressed at the very first sight of Him. The two merchants worshipped Him and became His first two disciples on just seeingHim, and wanting to offer Him a meal offered bees’ honey and rice pops as a gift. Then Mudalindu seeing Him stopped on his way to cover him from the rain. All this go to show us that the Buddha made an impressive picture during the first few weeks of His enlightenment. The Buddha then, probably realising this, made himself to appear as a normal person, when he set forth to meet the Pancha- waggiya Bhikkhus to teach them the Dhamma. During the Buddha's life on many instances, we see that He appeared a normal ascetic. 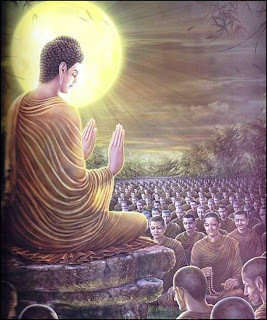 For example after the Buddha became famous and had many disciples after several years had passed, the Brahmin clansman, Pukkusathi (who considered himself a disciple of the Buddha, and was practising on His teachings but had not yet seen Him) did not even recognise Him, until he had listened to a full discourse on Nibbana. Thereafter, understanding that this indeed is the Buddha, His much Venerated Teacher whom he had not seen thus far, worshipped and venerated Him, before he departed from the Blessed One soon after the discourse. The Buddha had thousands of disciples both men and women, who became enlightened themselves after He started teaching on Asala full moon day to the Pancha Waggiya Bhikkus. Read the first discourse. No other teacher had such a large number of followers in history. The Method that helped Ascetic turned Prince Sidhattha to get enlightened - is just residing in the present moment watching your breath, and going inwards to the silence within. Read download it and save it on to your desk top. Have a look at the Pali scripture teaching in English (Roman)script . This is a very common method that is unique to Gauthama Buddha. He was the first person who taught the world how focusing the mind on in and out breath leads to liberation. It was He who showed the world how one can reach the very deep stillness of the quiet mind by being aware of the in and out breathing of the body and thereby get enlightened. If you are interested you can see the Pali version in Roman script look here. See instructions below. After clicking you will come to the Chaṭṭha Saṅgāyana web page with a column to your left. It will open a blank page with Tipitaka (Roman) folder displayed on the left side. Then follow the path below. the + sign on Tipitaka Mūla opens Suttapitaka. the + sign on Suttapitaka opens Majjhimanikāya. Click on the + sign on Uparipannāsapāli and the suttas of this pitaka will open up on the right hand side of the page. Go down this page until you come to Sutta Number 8 Ănāpānassatisuttaṃ. This is after Mahācattārisakasuttaṃ (7). Listen to the Sutta - Ajahn Brahm explains in English- download it and listen to it(free) in MP3 format - then you can write your own CDs and give it as a gift to your friends. "Of all Gifts the Gift of Dhamma is the highest." So here I am giving it to you. Get Enlightened !!! [i] Mara –the name refers to the evil one who blocks enlightenment. Also referred to as the defilements in the mind that blocks enlightenment. Mara refers to death in many Indian languages. [ii] Acharya Arisen Ahubudu is a Scholar who researched on ancient Sinhala writings and “Hela” language. According to him there had been a Sinhala “Janapadhaya” ( state or territory) in Northern India. "Sabba dānaṁ Dhamma dānaṁ jināthi"